Dark clouds above the waterfall Aldeyjarfoss. The river Skjálfandafljót drops from a height of 20 m through basalt rock columns. Aldeyjarfoss is in the highlands of Iceland at the Sprengisandur Highland Road in Norðurland Eystra, Iceland. This photo was taken at noon on a cloudy day in September of 2013. This photo is part of the exhibition Waterfalls of Northern Europe (Oct'14). 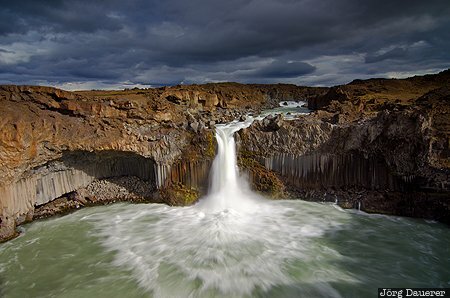 This photo is in the Photo Calendar "Iceland". This photo was taken with a digital camera.